Park Plaza Westminster Bridge London is set to open on 4 February 2010. The soft-opening period will offer limited availability as the £350m property undergoes final preparations including the completion of a spa, pool and gym. 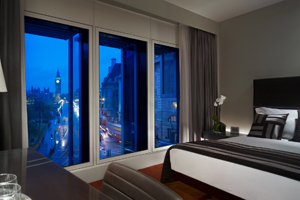 The 1,021-room hotel will be located on London's South Bank, near the London Eye, London Aquarium and Royal Festival Hall. It will offer 2,700sqm of meeting space, a spa with eight treatment rooms and a fitness centre incorporating a 15-metre swimming pool.